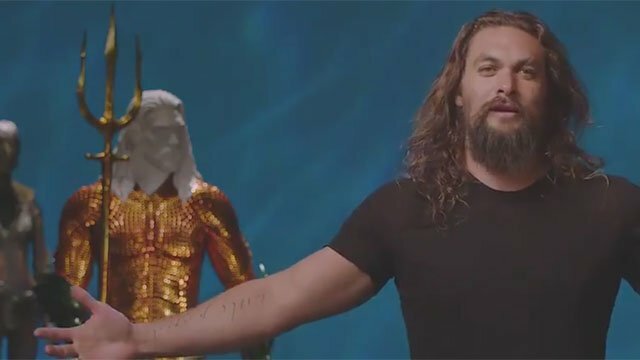 Halloween is almost over, but Aquaman star Jason Momoa has a special greeting for anyone interested in his upcoming movie. Momoa was featured in a video posted on the official Aquaman twitter account, which showed off his classic yellow and green costume. This outfit has been glimpsed before, but this is one of the best videos to date in terms of detail and clarity. “Why be anything else if you can be Aquaman?” To be honest, “Batman” is usually the hero in question. Or Superman, or Spider-Man, or any number of superheroes. Aquaman isn’t usually anyone’s top choice. Part of the reason for that may be his portrayal in Super Friends as the guy who can talk to fish. Comic creators like Peter David and Geoff Johns have gone a long way to reestablish Aquaman’s hero cred in DC’s comics. Momoa’s performance in Justice League may have also helped his cause. But we won’t know for sure if audiences will embrace the sea king until late December. James Wan (Furious 7) helmed the Aquaman movie, and it’s his vision that will be depicted on screen. Amber Heard co-stars in the movie as Mera, Aquaman’s long time partner and lover. Willem Dafoe will play Vulko, an Atlantean who may mentor Arthur / Aquaman. Patrick Wilson is stepping into the role of Arthur’s evil brother, Orm / Ocean Master:Yahya Abdul-Mateen II is portraying the secondary villain, Black Manta. Finally, Nicole Kidman is playing Arthur and Orn’s mother, Queen Atlanna. Aquaman will swim into theaters on Friday, December 21. What do you think about Momoa’s classic Aquaman costume? Let us know in the comment section below!